Last month I made a new friend. Her name is Marion and she is from Houston, Texas. We were amazed at how much we have in common, and formed an instant rapport – almost as if we had known each other in a past life. So, I was saddened to learn she is engaged in a battle with a little known disease called inflammatory breast cancer. She suggested I do a piece to make our readers aware of this insidious condition which is rarely diagnosed until late stages. Marion is one of the lucky ones who has responded well to treatment. Unlike traditional breast cancer, this disease has no lumps and does not even show up on a mammogram. It attacks the lymph system of the breast and the surrounding lymph nodes. 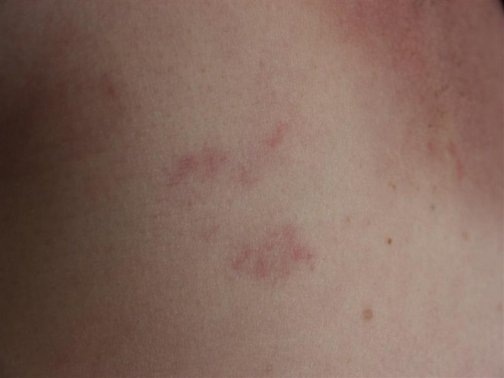 The first signs are usual a swollen, red, hot, or a breast with a rash. It can cause the skin of the breast to become the texture of an orange peel. When Marion noticed swelling in one of her breasts, she made a doctor’s appointment. “I started out by going to my ob/gyn and he knew what it was right away. This is often NOT the case and women go on for months before being diagnosed.” she explained. It is often mistaken for mastitis or a breast infection. “I was diagnosed in August of ’06 at age 54 but I guess I was really 53 when it started, my birthday was July 8th. Women even in their 20’s have been diagnosed,” she noted. “I am a rare bird. I have stage IV, which is the highest stage of cancer. It has masticized to the bone- in my case the spine and sternum. The death rate with IBC is about 70% in three years, but with the aggressive treatment Marion received at MD Anderson, she is doing well. “First I had a port placed to receive my treatment. That very day I went for my first chemo treatment. I underwent 6 rounds of heavy chemotherapy, lost my hair and the whole works,” she said. This was followed by a modified radical mastectomy. including taking not just the breast, but the muscle tissue under it. They have to make sure all the skin is gone, because the cancer is in the skin. “I also had intense radiation everyday for six weeks. Since then I have continued treatment every three weeks. In addition, I am given a bone drug-at first every three weeks, then went to every six weeks, now every three months. This is part of my infusion and is trying to keep the bones firm in areas where the cancer was,” she said. “Some women diagnosed after me with stage III have already died and I am still here. I really believe I am still alive because people pray for me. I have no other explanation. Here are a few websites you can visit to learn more about this disease. This entry was posted in Health and well-being and tagged Inflammatory Breast Cancer by Emily Jones. Bookmark the permalink. we can always prevent cancer by regular self-breast exams`,. Even though it doesn’t cause lumps, can it in addition to other symptoms? 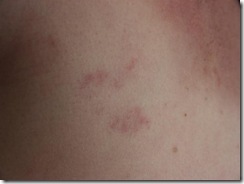 I’ve had this rash above my right breast for almost 4 months. It started off as a mosquito bite. Like hives. Itched and still itches. Went to drs and they said it was just a rash. Use lotion and cortisone. That was two months ago. Sometimes it gets dry and flakey. Most times it like picture below. Breast cancer with a new slant•The Deluded DivaThe Deluded Diva is kinda vanilla. write news titles to grab viewers to click.